The Chukchee ideal warrior is so skilled in jumping that he is almost able to fly in the air with the birds. When paddling in a kayak, he keeps pace with a flying gull. His build is athletic. When lying on his back, he touches the ground only with his neck, buttocks, and heels, so thick and heavy are his muscles. Siberian raiders attacked St. Lawrence Island in spring and summer, trying to take valuables as well as prisoners. Yupik elder Roger Silook wrote that when enemy boats appeared, defenders “would make it rain with arrows” to repel them. 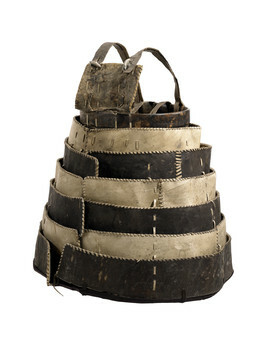 This armor skirt, worn to protect the lower body, is made of six telescoping hoops of doubled bearded seal hide, alternating between dark (scraped) and light (aged) skin. The hoops were lifted and secured at the waist to enable the fighter to run or walk freely. On top is a hide chest protector with shoulder straps.